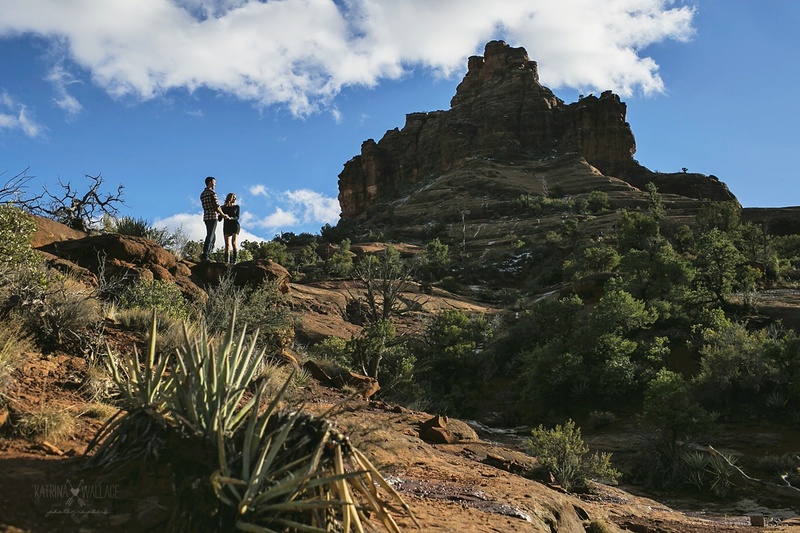 One of our favorite locations for engagement sessions is Sedona! Because we have a sister company that specializes in Sedona engagement session photography and weddings in Sedona we are super familiar with stunning locations in Sedona for shoots. You can see our sister company website at Sedona Bride Photographers where we list many of our favorite locations. 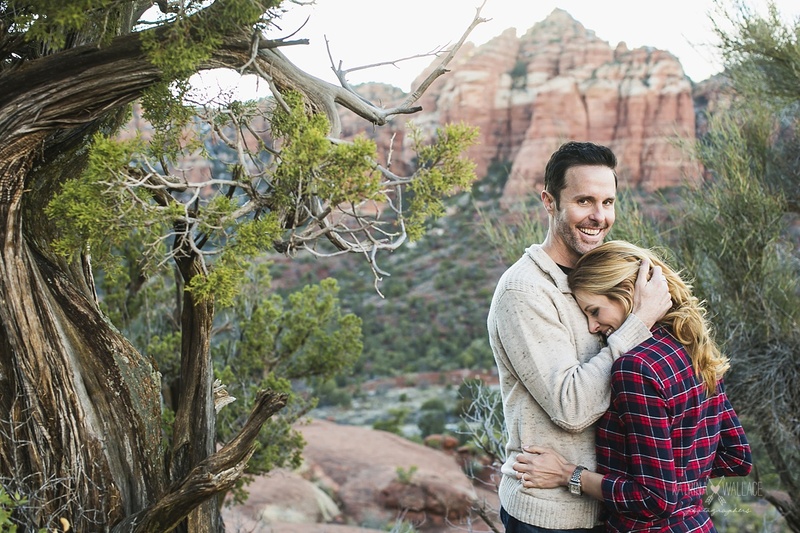 One of our clients who’s getting married next year at the Sanctuary Resort opted for an engagement season this winter in Sedona and asked for clothing ideas for winter engagement sessions and it reminded us of one of our favorite winter engagement sessions shoots. The photos were taken on Bell Rock, which is a popular location because of the amazing 360 degree red rock vista views and it’s ease of access. It’s just a short 10 minute easy hike up to these views. This also makes it a popular location for tourists to easily go to so we always recommend planing your engagement session for weekdays whenever possible to avoid crowds and make parking and your drive to Sedona a little easier. Enjoy these images from Brie and Chris’ winter engagement session! This first photo is on the norther side of Bell Rock … the iconic Bell Rock views are from the southern side as you drive north into Sedona on 179 … we love this back side of Bell Rock because of the additional red rock vista views accessible from this hike. It’s a fairly easy hike up the mountain side and we’ve got the timing down to plan for the best light … we light to try to follow the light up Bell Rock shooting as the sun hits the side of the mesa which eventually puts Bell Rock into a shadow. Once you get mid way up Bell Rock there are these expansive vista red rock views. Can you see the snow in the background? A silhouette! … we love to shoot both “backlit” images … where the sun light is behind couples or front lit or side lit or silhouette … backlit images are similar to the images at the end of this post but you’ll see that the other types of light are really beautiful and dramatic and add some flair and fun to a shoot. Playing with the light and contrast …. Sedona is still a desert … it’s considered high desert …. and while snow stays longer in Flagstaff which is only about an hour from Sedona, at 4500 feet elevation it’s still warm enough to melt snow pretty quickly … we’re pretty lucky to ever have a shoot in the snow in Sedona. The images from here are the in the soft last light of day in the shaded areas of the mountain which makes for classic beautifully lit Sedona engagement session photography. See more engagement session photography. Arizona is such a diverse state rich with stunning scenery for engagement sessions and wedding photography. And as always you can learn more about us as a husband and wife photography team on our website as well.